The is Middle Dutch Church where some of the enlisted men captured at the Battle of Long Island were imprisoned. The Sugar House also became a prison as the British captured more of Washington’s soldiers during the retreat from New York. The sight today is the location of the Chase Manhattan Bank. Statue of Glover on Commonwealth Avenue, Boston. 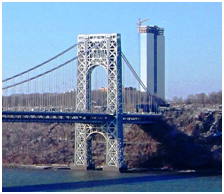 The George Washington Bridge, connecting Fort Lee in Bergen County across the Hudson River to New York City, is the world’s busiest motor vehicle bridge. 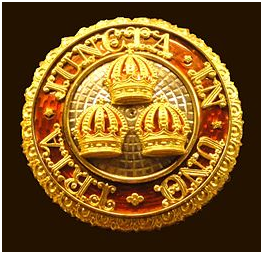 The Most Honourable Order of the Bath (formerly the Most Honourable Military Order of the Bath) is a British order of chivalry founded by George I on 18 May 1725. The name derives from the elaborate medieval ceremony for appointing a knight, which involved bathing (as a symbol of purification) as one of its elements. The knights so created were known as “Knights of the Bath”.George I “erected the Knights of the Bath into a regular Military Order”. 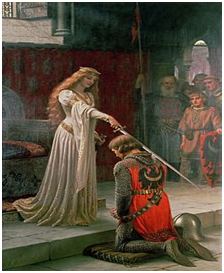 He did not (as is commonly believed) revive the Order of the Bath, since it had never previously existed as an Order, in the sense of a body of knights who were governed by a set of statutes and whose numbers were replenished when vacancies occurred. 2. 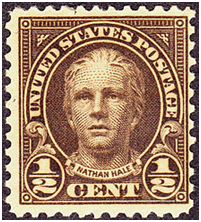 Nathan Hale was born in Coventry, Connecticut, in 1755 to Richard Hale and Elizabeth Strong. In 1768, when he was fourteen years old, he was sent with his brother Enoch, who was sixteen, to Yale College. Nathan was a classmate of fellow patriot spy Benjamin Tallmadge The Hale brothers belonged to the Linonian Society of Yale, which debated topics in astronomy, mathematics, literature, and the ethics of slavery. Nathan graduated with first-class honors in 1773 at age 18 and became a teacher, first in East Haddam and later in New London. After the Revolutionary War began in 1775, he joined a Connecticut militia and was elected first lieutenant within five months. His militia unit participated in the Siege of Boston, but Hale remained behind. It has been suggested that he was unsure as to whether he wanted to fight, or whether he was hindered because his teaching contract in New London did not expire until several months later, in July 1775. On July 4, 1775, Hale received a letter from his classmate and friend Benjamin Tallmadge, who had gone to Boston to see the siege for himself. He wrote to Hale, “Was I in your condition, I think the more extensive service would be my choice. Our holy Religion, the honour of our God, a glorious country, & a happy constitution is what we have to defend. Tallmadge’s letter was so inspiring that, several days later, Hale accepted a commission as first lieutenant in the 7th Connecticut Regiment under Colonel Charles Webb of Stamford. In the following spring, the army moved to Manhattan Island to prevent the British from taking over New York City. In September, General Washington was desperate to determine the location of the imminent British invasion of Manhattan Island. To that end, Washington needed a spy behind enemy lines, and Hale was the only volunteer. During his mission, New York City (then the area at the southern tip of Manhattan around Wall Street) fell to British forces on September 15 and Washington was forced to retreat to the island’s north in Harlem Heights (what is now Morningside Heights). On September 21, a quarter of the lower portion of Manhattan burned in the Great New York Fire of 1776. The fire was later widely thought to have been started by American saboteurs to keep the city from falling into British hands, though Washington and the Congress had already denied this idea. It has also been speculated that the fire was the work of British soldiers acting without orders. In the fire’s aftermath, more than 200 American partisans were rounded up by the British. 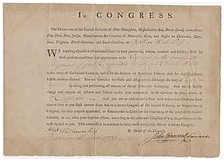 An account of Nathan Hale’s capture was written by Consider Tiffany, a Connecticut shopkeeper and Loyalist, and obtained by the Library of Congress. In Tiffany’s account, Major Robert Rogers of the Queen’s Rangers saw Hale in a tavern and recognized him despite his disguise. 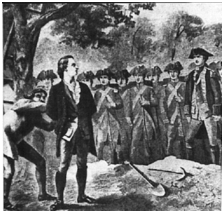 After luring Hale into betraying himself by pretending to be a patriot himself, Rogers and his Rangers apprehended Hale near Flushing Bay in Queens, New York. Another story was that his Loyalist cousin, Samuel Hale, was the one who revealed his true identity. British General William Howe had established his headquarters in the Beekman House in a rural part of Manhattan, on a rise between 50th and 51st Streets between First and Second Avenues, near where Beekman Place commemorates the connection. Hale reportedly was questioned by Howe, and physical evidence was found on him. Rogers provided information about the case. According to tradition, Hale spent the night in a greenhouse at the mansion. He requested a Bible; his request was denied. Sometime later, he requested a clergyman. Again, the request was denied. According to the standards of the time, spies were hanged as illegal combatants. On the morning of September 22, 1776, Hale was marched along Post Road to the Park of Artillery, which was next to a public house called the Dove Tavern (at modern-day 66th Street and Third Avenue), and hanged. He was 21 years old. Bill Richmond, a 13-year-old former slave and Loyalist who later became a boxer in Europe, was reportedly one of the hangmen, responsible for securing the rope to a strong tree and preparing the noose. 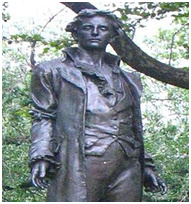 British hang spy Nathan Hale in New York City, 1776. The story of Hale’s quote began with John Montresor, a British officer who witnessed the hanging. Soon after the execution, Montresor spoke with the American officer William Hull about Hale’s death. Later, it was Hull who widely publicized Hale’s use of the phrase. Because Hull was not an eyewitness to Hale’s speech, some historians have questioned the reliability of the account. Munson had tutored Hale before college, and knew him and his family well, so even though the particulars of this speech may be unlikely, Munson knew firsthand what Hale’s opinions were. 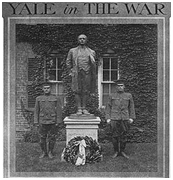 Nathan Hale statue flanked by Yale servicemen, Yale campus, New Haven, Connecticut, November 1917. 3. Charles Lee (6 February 1732– 2 October 1782) served as a general of the Continental Army during the American War of Independence. He also served earlier in the British Army during the Seven Years War. He sold his commission after the Seven Years War and served for a time in the Polish army of King Stanislaus II. Lee moved to North America in 1773 and bought an estate in Virginia. When the fighting broke out in the American War of Independence in 1775, he volunteered to serve with rebel forces. Lee’s ambitions to become Commander in Chief of the Continental Army were thwarted by the appointment of George Washington to that post. During 1776, forces under his command repulsed a British attempt to capture Charleston, which boosted his standing with the army and Congress. Later that year, he was captured by British cavalry under Banastre Tarleton; he was held by the British as a prisoner until exchanged in 1778. During the decisive Battle of Monmouth later that year, Lee led an assault on the British that miscarried. He was subsequently court-martialed and his military service brought to an end. He died in Philadelphia in 1782. Lee was born on February 6, 1732 [26 January 1731] in Dernhall, Cheshire, England, the son of Major General John Lee and his wife Isabella Bunbury (daughter of Sir Henry Bunbury, 3rd Baronet). He was sent to King Edward VI School, Bury St Edmunds, a free grammar school, and later to Switzerland, where he became proficient in several languages, including Latin, Greek, and French. His father was Colonel of the 55th Foot (later renumbered the 44th) when he purchased a commission on April 9, 1747 for Charles as an entry-level ensign in the same regiment. After completing his schooling, Lee reported for duty with his regiment in Ireland. Shortly after his father’s death, on 2 May 1751 he received (or purchased) a Lieutenant‘s commission in the 44th. 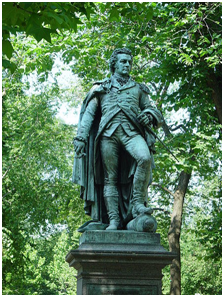 He was sent with the regiment to North America in 1754 for service in the French and Indian War under Major General Edward Braddock, in what was a front for the Seven Years War between Britain and France. He was with Braddock at his defeat at the Battle of the Monongahela in 1755. During this time in America, Lee married the daughter of a Mohawk Indian chief. His wife (name unknown) gave birth to twins. Lee was known to the Mohawk, who were allies of the English, as Ounewaterika or “Boiling Water”. 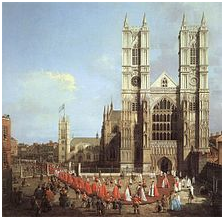 On 11 June 1756 Lee purchased a Captain’s commission in the 44th for the sum of £900. 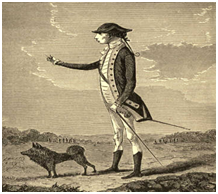 The following year he took part in an expedition against the French fortress of Louisbourg, and on 1 July 1758 he was wounded in a failed assault on Fort Ticonderoga. He was sent to Long Island to recuperate. A surgeon whom he had earlier rebuked and thrashed attacked him. After recovering, Lee took part in the capture of Fort Niagara in 1759and Montreal in 1760. This brought the war in the North American theater to an end by completing the Conquest of Canada. Lee went back to Europe, transferred to the 103rd Foot as a major, and served as a Lieutenant Colonel in the Portuguese army. He fought against the Spanish invasion of Portugal (1762) and distinguished himself under John Burgoyne at the Battle of Vila Velha. He returned to England in 1763 following the Peace of Paris, which ended the Seven Years’ War. His regiment was disbanded and he was retired on half pay as a Major. 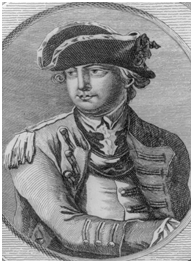 In May 1772, although still inactive, he was promoted to Lieutenant Colonel. 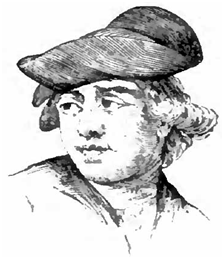 Lee as depicted in Appletons’ Cyclopædia of American Biography. George Washington was sober, steady, calm, and best of all, would work without pay. 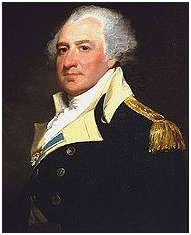 Washington also was a good political choice: a southern commander to pair with a primarily New England fighting force. Washington received the appointment, and Lee was offered the subordinate rank of Major General. Because of this, Lee had nothing but the utmost disdain for his superior. He once remarked, “Washington is not fit enough to command a Sergeant’s Guard”. Lee was often considered second in command of the Continental forces, although Artemas Ward, who was not in good health, officially held this position. 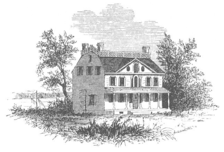 During the encampment at Valley Forge in late 1777 and early 1778, Lee’s headquarters was at the David Harvard House. Lee also received various other titles: in 1776, he was named Commander of the so-called Canadian Department, although he never got to serve in this capacity. He was appointed as the first Commander of the Southern Department. He served in this post for six months, until he was recalled to the main army. During his time in the South, the British sent an expedition under Henry Clinton to recover Charleston, South Carolina. Lee oversaw the fortification of the city. Fort Sullivan was a fortification built out of palmetto logs, later named for Commander Col. William Moultrie. Lee ordered the army to evacuate the fort because as he said it would only last thirty minutes and all soldiers would be killed. Governor John Rutledge forbade Moultrie to evacuate and the fort held. The spongy palmetto logs repelled the cannonball from the British ships. The assault on Sullivan’s Island was driven off, and Clinton abandoned his attempts to capture the city. Although the credit of the defense was not Lee’s, he was called “hero of Charleston”. When Lee arrived in New York to join General Washington and the main part of the Continental Army, Washington chose to show his appreciation by changing the name of Fort Constitution, which was located on the New Jersey side of the Hudson opposite Fort Washington, to Fort Lee. General Lee was a very popular general officer among not only the army, but Congress. Toward the end of 1776, Lee’s animosity for Washington began to show. During the retreat from forts Washington and Lee, he dawdled with his army, and intensified a letter campaign to convince various Congress members that he should replace Washington as Commander-in-Chief. Although his army was supposed to join that of Washington’s in Pennsylvania, Lee set a very slow pace. On the night of December 12, Lee and a dozen of his guard inexplicably stopped for the night at White’s Tavern in Basking Ridge, New Jersey, some three miles from his main army. The next morning, a British patrol of two dozen mounted soldiers found Lee writing letters in his dressing gown, and captured him. Among the members of the British patrol was Cornet Banastre Tarleton and William Harcourt, 3rd Earl Harcourt. Lee returned to service a couple of years later after he was exchanged for General Richard Prescott. During the Battle of Monmouth in June 1778, Washington needed a secondary commander to lead the frontal assault. He unwillingly chose to put Lee in charge, as he was the most senior of his generals. 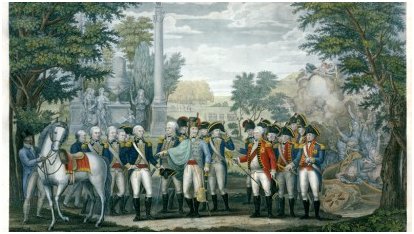 At first, Lee was so reluctant to take part in the attack that Washington bestowed command onto Marquis de Lafayette. Upon this, Lee had a change of heart and requested that Lafayette cede command, which he gladly did. Washington ordered him to attack the retreating enemy, but instead, Lee ordered a retreatafter only one volley of fire. After seeing this, Lafayette sent a messenger to Washington informing him of this behavior. Lee’s troops retreated directly into Washington and his troops, who were advancing, and Washington dressed him down publicly. Lee responded with insubordination for which he was arrested. 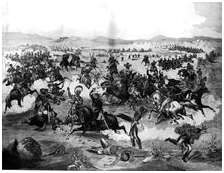 It is not clear that Lee had made a bad strategic decision; he believed himself outnumbered (which he was; British commander Sir Henry Clinton had 10,000 troops to Lee’s 5,440) and that a retreat was reasonable. But he disobeyed orders, and he publicly expressed disrespect to his Commander in Chief Washington had wanted to test the abilities of Lee’s troops, since they were among the first to be trained in European tactics by Baron von Steuben. Some historians have suggested that Lee may have retreated at the Battle of Monmouth as part of a plan to aid the British. While Lee was being held prisoner by British General Sir William Howe, 5th Viscount Howe in March 1777, he drafted a plan for British military operations against the Americans. At the time, Lee was under a threat of being tried as a deserter from the British Army because he hadn’t resigned his British commission as Lieutenant-Colonel until several days after he accepted an American commission. The plan in Lee’s handwriting was found in the Howe family archives in 1857. Lee tried to get Congress to overturn the court-martial‘s verdict. When this failed, he made open attacks on Washington’s character. Lee’s popularity then plummeted. Colonel John Laurens, an aide to Washington, challenged him to a duel, in which Lee was wounded in his side. He was challenged to many more duels. Lee was released from his duty on January 10, 1780. He retired to his estate in the Shenandoah Valley where he bred horses and dogs. While visiting Philadelphia, he was stricken with fever and died in a tavern on October 2, 1782. He was buried there in the churchyard of Christ Church. Lee left his property to his sister, Sidney Lee, who died unmarried in 1788. Fort Lee, New Jersey, on the west side of the Hudson River (across the water from Fort Washington, New York) was named for him during his life. Lee, Massachusetts, Lee, New Hampshire and Lee town, West Virginiawere also named for him.